The Sacramento Life Center Mobile Medical Clinic delivers high-quality, professional medical services including pregnancy testing and verification and a safe and convenient environment to talk through your options. We are a non-profit, community funded organization that provides services at no cost to our patients. We also provide Presumptive Eligibility for those who have a positive test and are in need of insurance. We know transportation issues may exist, that’s why the Sacramento Life Center Mobile Medical Clinic makes it easier for you to reach us. We go out 4 times a week (Monday-Thursday). We provide convenient hours and flexible locations to suit your needs. Our Mobile Clinic is staffed with a female patient advocate and male patient advocate (who also drives the mobile clinic). Each day you’ll be greeted with a different, warm and friendly female patient advocate. What’s happens in the mobile? When you come in for pregnancy testing, you’ll first fill out paperwork. Then, we’ll talk about your needs and/or situation. Regardless of how you may feel about your possible pregnancy, we’re here for you. We are here to support you, empower you, and provide the information and resources you need. We provide confidentiality and total compassion when discussing your pregnancy options. 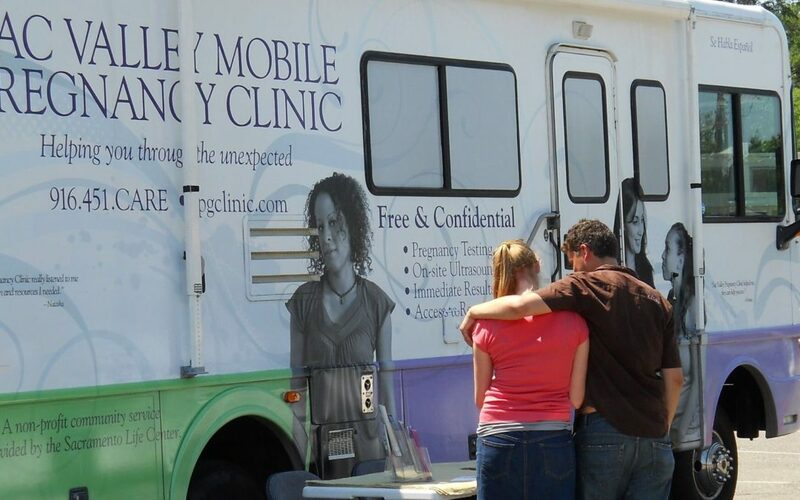 You won’t be judged at the Sacramento Life Center Mobile Medical Clinic. We realize every woman has her own unique challenges, and we’ll walk you through all your available options, step by step. Ultrasound appointments are scheduled at our main clinic. For the fathers-to-be, we have the Men’s Voice Project (MVP). You can talk to the male patient advocate one-on-one, learn about fetal development and discuss pregnancy options. Guys, we have your back and are here to support you too. Scared, concerned? Come talk with our friendly male patient advocate. If you happen to see the Sacramento Life Center Mobile Medical Clinic, stop by and say hi! Walk-ups are always welcome.